Roman Safiullin of Russia and Tereza Mihalikova of Slovakia became the first players from their countries to raise the winners trophies at the Australian Open Junior Championships Saturday in Melbourne. The unseeded Mihalikova defeated No. 14 seed Katie Swan of Great Britain 6-1, 6-4 capping a run that saw her grow in confidence with each win. After defeating No. 2 seed Jil Teichmann of Switzerland 5-7, 7-5(5), 7-5 in the second round and unseeded Sara Tomic of Australia 7-5, 2-6, 6-2 in the third round, the 16-year-old Slovak played with increasing confidence, defeating two unseeded players--Charlotte Robillard-Millette of Canada and Greet Minnen of Belgium--in straight sets to face Swan. Swan's gritty comeback in the semifinals against No. 5 seed Dalma Galfi of Hungary, in which Swan saved three match points, may have left her without the physical tools to challenge Mihalikova in the final, and Swan, a 15-year-old who lives in Wichita Kansas, did require a lengthy medical timeout just when she had seized the momentum in the second set, leading 3-0. Mihalikova won the next five games, and Swan could be seen testing her leg after any point requiring more than a couple of shots. Swan held after saving two match points in the ninth game, but despite Mihalikova going down 0-30, the Slovak recovered with some good first serves. On her third match point, and the first one of her serve, Mihalikova hit a good first serve that Swan could only return feebly, and a forehand winner ended the match. In addition to Swan's physical problems, or maybe because of them, she made more errors than usual, while Mihalikova was able to hit more winners, particularly when she came in, winning 17 of 22 of her points at the net. Mihalikova is the third straight unseeded girl to win a slam title, and she had to qualify to get into the main draw of the US Open Junior Championships just six months ago. Highlights of the girls final can be found at the tournament website. Swan discusses her fine run at the tournament with the BBC here. While Mihalikova was certainly an unexpected winner, having never been past the quarterfinals at a Grade 1 or Grade A tournament, Safiullin was a clear favorite for the title with his six Futures titles in 2014, although he had never gone past the third round in his previous three junior slams. The 17-year-old was facing an in-form Seong Chan Hong of Korea, seeded No. 7, who won the Grade 1 Traralgon warmup the week before. Although slight of build, Hong is fast and creative, and his defense and return have frustrated many a bigger and more powerful opponent. Safiullin came away with a 7-5, 7-6(2) victory, but the 17-year-old Hong made him earn it. Safiullin broke in the fifth game of the first set, but he was unable to serve it out at 5-4. Hong had a point to take a 6-5 lead, but lost the next three points and given a second chance, Safiullin took it, hitting good serves and clean winners to hold easily. He hit one serve at 130 mph (212 kmh) and averaged nearly 10 mph more on his serves than Hong. Hong was broken to start the second set, but again Safiullin couldn't hold on to his break, losing it with a loose sixth game. Serving to reach a tiebreaker at 5-6, Safiullin double faulted to give Hong a set point at 30-40, but Hong sent a routine forehand long and Safiullin closed out the game with two big serves. Safiullin started the tiebreaker with an aggressive volley winner and took control and a 5-1 lead by keeping the pressure on. Safiullin committed his only unforced error, a netted forehand, on the next point, but Hong's missed pass gave the Russian a match point, which he won when Hong's backhand sailed long. Safiullin, already 338 in the ATP rankings, is in the main draw of the $50,000 Burnie Australia Challenger next week, so he'll have little time to savor his junior slam title. For more on the finals, see the ITF website. Congratulations to Serena Williams on slam title number 19, moving her past Martina Navrilatova and Chris Evert into second place behind Steffi Graf's 22 (in the Open era). Chris Clarey of the New York Times has more on her 6-3, 7-6(5) win over Maria Sharapova in this article. The finals are set for Les Petits As, with top seed Anastasia Potapova of Russia, who has already won the Eddie Herr and Junior Orange Bowl 14s in the past month, facing No. 4 seed Olga Danilovic of Serbia in the girls championship match. Potapova defeated No.14 seed Kamilla Rakhimova, also of Russia, 6-4, 6-1 in the semifinals, while Danilovic stopped No. 2 seed Iga Swiatek of Poland 6-4, 6-0. Potapova can already claim one Les Petits As title, as she and partner Maria Novikova, the No. 7 seeds, defeated No. 4 seeds Siwatek and partner Maja Chwalinska 6-4, 6-3 in the girls doubles final. The boys singles final has wild card Chun Hsin Tseng of Taiwan, the No. 5 seed, playing No. 2 seed Timofey Skatov of Russia. Tseng, who has not lost a set, and only 17 games in five victories, beat No. 11 seed Nicolas Alvarez Varona of Spain 6-4, 6-1 in the semifinals, while Skatov needed three sets to get by No. 9 seed Nini Dica of Romania. Dica and partner Filip Jianu, the No. 2 seeds, won the boys doubles championship over the unseeded team of Tseng and Wociech Marek of Poland 7-5, 5-7, 10-7. Live streaming of the finals should be available through the tournament website beginning around 8 a.m. Eastern time. Sachia Vickery, who won her first pro title at the $25,000 tournament in Plantation two weeks ago, has an opportunity for a second Sunday when she meets 18-year-old Spaniard Sara Sorribes Tormo in the $25,000 Sunrise final. The 19-year-old Vickery, the No. 7 seed, beat Natalia Vikhlyantseva of Russia 7-5, 4-6, 6-2 in today's semifinals, while Sorribes Tormo defeated Darya Kasatkina of Russia, who beat her last week, 6-0, 6-0. Katerina Stewart and Anna Kalinskaya of Russia won the doubles title, beating Paula Goncalves and Beatriz Haddad Maia of Brazil 7-6(6), 5-7, 10-6 in the final. Tommy Paul lost to Patricio Heras of Argentina 7-6(3), 7-6(6) in the semifinals of the Palm Coast Futures, and No. 2 seed Connor Smith was beaten by Benjamin Balleret of Monaco 6-1, 6-0. At the $10,000 ITF women's circuit event in Guadeloupe, unseeded Nicole Frenkel has reached the final, defeating Dasha Ivanova 6-2, 4-6, 6-1 in today's semifinal. She will play No. 2 seed Sherazad Reix of France for the title. The qualifying draws for two big Pro Circuit challengers next week are out, with the men's Dallas $100,000 qualifying beginning today, and the women's Midland $100,000 qualifying beginning on Sunday. I will be in Midland for several days beginning Monday to cover that event. Three wild cards were announced today, with Lauren Embree, Bernarda Pera and Caroline Dolehide joining Sara Daavettila, who won the wild card tournament, in the main draw. The main draw wild cards in Dallas went to Connor Smith, Eric Quigley, Thai Kwiatkowski and Ryan Sweeting. The finals are set for the Australian Open junior championships, which will be held on Rod Laver Arena Saturday (later tonight in the US). Fifteen-year-old Katie Swan of Great Britain, who lives in Kansas, saved three match points, with the No. 14 seed coming back to defeat No. 5 seed Dalma Galfi of Hungary 0-6, 7-6(5), 7-5. She will face unseeded Tereza Mihalikova of Slovakia, who beat unseeded Greet Minnen of Belgium 6-4, 7-5. The two finalists have not played before. Swan, who was down 6-0, 4-2, is the first British girl in the final since Laura Robson made back to back appearances in 2009 and 2010. Mihalikova is the first Slovakian to reach the final since Katarina Basternakova in 1999. For more on Swan's comeback, which including cramping in the third set, see this article from the BBC. Top seed Roman Safiullin lost his first set of the tournament in Friday's semifinal with unseeded Djurabeck Karimov of Uzbekistan, but advanced with a 6-3, 6-7(4), 6-1 victory. He will face, for the first time, No. 7 seed Seong Chan Hong of Korea, who defeated No. 16 seed Akira Santillan of Australia 6-2, 7-6(2). Russia has not had an Australian Open boys finalist since Mikhail Youzhny in 1999; Korea's last boys finalist in Melbourne was Sun-Yong Kim in 2005. For more on the semifinals, see the ITF junior website. The junior singles finals have been streamed the past several years. See the tournament website for a link. The doubles champions were crowned Friday, with Australians Jake Delaney and Marc Polmans coming through in their home country to take the boys title. The unseeded pair defeated No. 8 seed Hubert Hurkacz of Poland and Alex Molcan of Slovakia 0-6, 6-2, 10-8. They are the third straight team with at least one Australian member to win the boys doubles title. The girls title went to No. 2 seeds Miriam Kolodziejova and Marketa Vondrousova of the Czech Republic, who defeated the unseeded team of Minnen and Katharina Hobgarski of Germany 7-5, 6-4. Complete draws are at the tournament website. And congratulations to Bethanie Mattek-Sands for her second grand slam doubles title. The 2012 Australian Open mixed doubles champion won the women's doubles title Friday with Lucie Safarova of the Czech Republic. In their first time playing together, the unseeded Safarova and Mattek-Sands won a lot of close matches, culminating with 6-4, 7-6(5) win over No. 14 seeds Yung-Jan Chan of Taiwan and Jie Zheng of China. For more, see this article from the tournament website. At the ITF Grade 1 in Ecuador, both Gianni Ross and Vasil Kirkov lost their semifinal matches in singles, but Francesca Di Lorenzo and Meghan Kelley, the No. 6 seeds, advanced to the doubles final, beating top seeds Mira Antonitsch of Austria and Tamara Zidansek of Slovenia 2-6, 6-4, 13-11. Two of the three 17-year-olds in action in the Palm Coast Futures quarterfinals lost, but Tommy Paul advanced, reaching his second career Futures semifinal, with a 6-3, 2-6, 6-2 win over top seed Marcelo Arevalo of El Salvador. It is the second straight week that Paul has beaten the top seed in a Futures tournament, having taken out Christian Lindell of Sweden in the second round last week in Weston. Paul will play unseeded Patricio Heras of Argentina in the semifinals. For the third week in a row, Francis Tiafoe lost to 32-year-old Benjamin Balleret of Monaco, this time dropping a 7-6(5), 6-2 decision, after losing to Balleret in the semifinals and finals in the previous two Futures in Florida. Reilly Opelka lost to No. 2 seed Connor Smith, despite 18 aces, 3-6, 6-3, 6-4, getting his only two break points in the opening set. Smith, who had no aces, was only two of 10 on his break chances, but it was enough to take the final two sets. One American woman reached the semifinals of the $25,000 Pro Circuit event in Sunrise, Florida, No. 7 seed Sachia Vickery, who at 19 is the oldest semifinalist. Vickery will play 17-year-old qualifier Natalia Vikhlyantseva of Russia, who beat Maria Sanchez 6-3, 6-1 today. In the top half, 18-year-old Sara Sorribes Tormo of Spain will play 17-year-old Darya Kasatkina of Russia, who is on an eight-match winning streak after taking the title last week in Daytona Beach. The French girls champion defeated Sorribes Tormo in the semifinals last week 4-6, 6-4, 6-4. At Les Petits As in Tarbes, France, both No. 5 seed Amanda Anisimova and unseeded Govind Nanda lost their quarterfinal matches in singles, so no Americans will be competing this weekend. Anisimova lost to No. 4 seed Olga Danilovic of Serbia 6-1, 6-1 and Nanda lost to No. 11 seed Nicolas Alvarez Varona of Spain 6-3, 6-4. Alvarez Varona will play No. 5 seed Chun Hsin Tseng of Taiwan, a wild card, in one semifinal, while the other will feature No. 9 seed Nini Dica of Romania against No. 2 seed Timofey Skatov of Russia. In the girls semifinals, top seed Anastasia Potapova will face fellow Russian Kamilla Rakhimova, the No. 14 seed, after both came from a set down to win in the quarterfinals. Danilovic will face No. 2 seed Iga Swiatek of Poland in the other semifinal, so a rematch of the dramatic semifinal of the Junior Orange Bowl last month could still take place on Sunday, should both Potapova and Swiatek win. For complete results, see the tournament page at Tennis Europe. The results from the Australian Open on Thursday were not good for the US juniors, with all three still remaining dropping their matches. No. 3 seed Taylor Fritz lost to No. 7 seed Seong Chan Hong of Korea in a battle neither are likely to forget, with Hong claiming a 6-7(4), 7-6(4), 6-0 victory, his first in three meetings with the 17-year-old Californian. Hong led 5-1 40-0 in the second set, but Fritz saved eight set points to pull even at 5-5, but dropped the tiebreaker and was unable to recover in the third set. In the semifinals, Hong will play Australian Akira Santillan, the No. 16 seed, who prevented a all-Korean meeting with a 6-4, 3-6, 6-3 win over No. 6 seed Duck Hee Lee. Hong and Santillan split two close matches in their previous two meetings last year. Top seed Roman Safiullin eliminated unseeded Marc Polmans of Australia 6-4, 6-2 and will face another unseeded player in the semifinals after Djurabeck Karimov of Uzbekistan came back to defeat No. 14 seed Stefanos Tsitsipas of Greece 3-6, 6-4, 6-1. No. 11 seed Raveena Kingsley was defeated by No. 14 seed Katie Swan of Great Britain 6-4, 6-3, with Swan looking to take out a third straight higher seed when she meets No. 5 seed Dalma Galfi of Hungary. Galfi downed No. 4 seed Ailona Bolsova Zadoinova of Spain 6-1, 7-6(4). The other girls semifinal features two unseeded players, both of whom advanced by scores of 6-2, 6-2. Tereza Mihalikova of Slovakia defeated Charlotte Robillard-Millette of Canada and Greet Minnen of Belgium defeated Manca Pislak of Slovenia. Hong and Santillan are the only pair of semifinalists to have met previously in ITF junior events. For more on Katie Swan, see this BBC article. Minnen is the only player still in both singles and doubles, and she will go for her first title Friday, when she and Katharina Hobgarski of Germany, who are unseeded, will play No. 2 seeds Marketa Vondrousova and Miriam Kolodziejova of the Czech Republic. In the boys doubles final, unseeded Jake Delaney and Polmans will play No. 8 seeds Hubert Hurkacz of Poland and Alex Molcan of Slovakia. Delaney and Polmans defeated Mate Valkusz of Hungary and Louis Wessels of Germany 2-6, 6-1, 11-9. No. 3 seeds Michael Mmoh and Miomir Kecmanovic of Serbia struggled in their final two tiebreakers after saving nine set points to take the first one, falling 6-7(9), 7-6(0), 10-2. The draws are available at the tournament website. At Les Petits As, unseeded Govind Nanda defeated top seed Jack Draper of Great Britain 5-7, 6-4, 7-6(7) to advance to the quarterfinals. No. 5 seed Amanda Anisimova, a finalist last week at the Nike Teen Tennis event in Bolton, also reached the quarterfinals, defeating No. 11 seed Taisya Pachkaleva of Russia 6-1, 6-3. Teen Tennis champion Caty McNally lost however, with the No. 3 seed going out to No. 14 seed Kamilla Rakhimova of Russia 7-6(5), 3-6, 6-3. All three US team in the doubles quarterfinals lost, including Anisimova and McNally, the top seeds. They went out to No. 7 seeds aria Novikova and Anastasia Potapova of Russia 5-7, 7-6(5), 15-13. In a match tiebreaker that long, whoever wins is going to have saved match points and I believe the Russians saved four beginning at 8-9 down. For results, see the Tennis Europe tournament page. Two US qualifiers have reached the semifinals of the ITF Grade 1 in Ecuador. 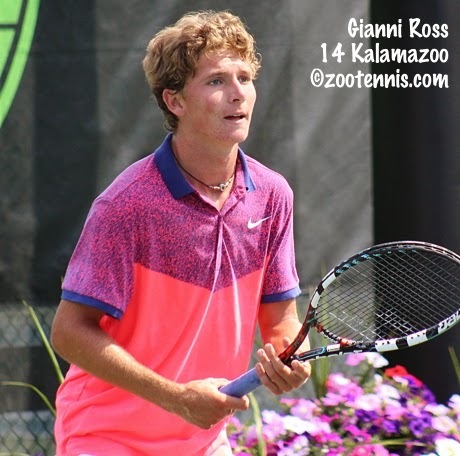 Gianni Ross, who turns 16 next week, won his second straight match in a third set tiebreaker today, defeating No. 7 seed Nuno Borges of Portugal 6-3, 4-6, 7-6(3). Vasil Kirkov, who turns 16 in March, had beaten No. 5 seed Yshai Oliel of Israel 6-2, 6-0 in the quarterfinals and reached the semifinals with a 6-4, 6-3 win over unseeded Benjamin Sigouin of Canada today. No. 7 seed Francesca DiLorenzo, the only US girls to reach the quarterfinals, lost to No. 16 seed Jaqueline Christian of Romania 6-0, 6-2. Young US players continue to post good results at Futures events in Florida this year, with wild cards Francis Tiafoe and Reilly Opelka and special exempt entry Tommy Paul, all 17 years old, reaching the quarterfinals of the Palm Coast $10,000 tournament. Tiafoe defeated No. 8 seed Daniel Dutra da Silva of Brazil 6-3, 6-7(5), 6-2 to set up yet another meeting with Benjamin Balleret of Monaco, who has defeated him in the previous two Futures, in the semifinals and last week, in the finals. Opelka defeated Facundo Mena of Argentina 6-3, 6-0 and Paul outlasted Romain Arneodo of Monaco 7-5, 4-6, 7-5. Paul will play top seed Marcelo Arevalo of El Salvador, the former Tulsa star, and Opelka gets No. 2 seed Connor Smith, the Ohio State standout. US teenagers are having another good week in the Caribbean, at the $10,000 tournament in Guadeloupe. Last week's champion Usue Arconada, Nicole Frenkel and Dasha Ivanova advanced to the quarterfinals, as did former Alabama All-American Alexa Guarachi. Frenkel and Arconada, both 16, will play each other on Friday. At the Pro Circuit women's $25,000 tournament in Sunrise, Florida, qualifier CiCi Bellis lost to French Open champion Darya Kasatkina of Russia 6-4, 6-1 and Katerina Stewart fell to Sara Sorribes Tormo of Spain 6-4, 3-6, 6-3. The only US women to make it to the quarterfinals are Maria Sanchez and No. 7 seed Sachia Vickery. 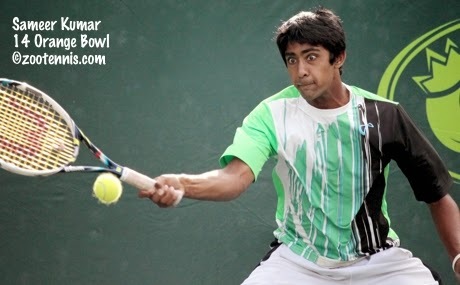 The Maui Challenger has also showcased some of the top teenaged talent from the United States. Eighteen-year-old Jared Donaldson defeated No. 7 seed Chase Buchanan 6-1, 6-3 and Stefan Kozlov, who will be 17 next week, beat No. 3 seed Michael Russell 7-6(2), 6-3. Nick Meister and Dennis Novikov, former teammates at UCLA, also both advanced to the quarterfinals, as did No. 2 seed Bradley Klahn. Top seed Denis Kudla was upset by qualifier Takanyi Garanganga of Zimbabwe 3-6, 6-4, 6-4. The USTA announced on Wednesday that both Donaldson and Kozlov had received main draw wild cards into the upcoming ATP tournament in Memphis. No. 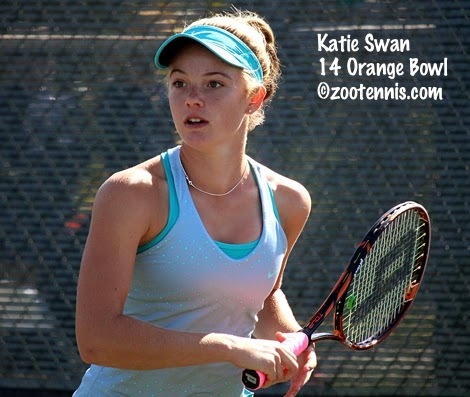 14 seed Katie Swan of Great Britain defeated top seed Shilin Xu of China 6-2, 6-2 Wednesday in the third round of the Australian Open Junior Championships to earn her second appearance in a Grade A quarterfinal against Raveena Kingsley, who will be making her first. Kingsley, the No. 11 seed, defeated unseeded Viktoria Kuzmova of Slovakia 6-4, 6-1, in a performance that contrasted with her previous 9-7 in third set win over Vera Lapko of Belarus. Kingsley saved all seven of the break points against her, while converting three of the four break points Kuzmova gave her. No. 3 seed Taylor Fritz will represent the US in the boys quarterfinals after his 6-1, 6-1 win over Marko Osmakcic of Switzerland, which took only 39 minutes, but saw Fritz get only 35% of his first serves in and get broken in the two games he lost. Fritz will play No. 7 seed Seong Chan Hong Thursday (tonight in the US), having beaten the 17-year-old Korean in their previous two meetings in the Osaka Grade A quarterfinals and the Roehampton Grade 1 quarterfinals. Sameer Kumar lost a tough match to No. 6 seed Duck Hee Lee of Korea, losing nine straight games in the second and third sets, but battling back to tie the third set at 5-5, only to drop serve in the final game of Lee's 2-6, 6-0, 7-5 victory. Michael Mmoh and his partner Miomir Kecmanovic of Serbia are into the doubles semifinals after defeating Yuya Ito and Yusuke Takahashi of Japn 6-2, 6-2. The No. 3 seeds will now play No. 8 seeds Hubert Hurkacz of Poland and Alex Molcan of Slovakia, after Hurkacz and Molcan eliminated No. 2 seed Will Blumberg and Orlando Luz of Brazil 6-2, 7-6(2). Raquel Pedraza and her partner Wushuang Zheng of China lost to No. 4 seeds Xu and Sara Tomic of Australia 6-4, 1-6, 11-9. Zheng and Xu are featured in this article from the Associated Press about China's search for a tennis player who can follow in the footsteps of recently retired two-time slam winner Li Na. For draws, see the tournament website. In the women's draw, unseeded Madison Keys, who turns 20 next month, will take on top seed Serena Williams tonight after beating Venus Williams 6-3, 4-6, 6-4 in Wednesday's quarterfinal. Louisa Thomas of Grantland looks at Keys game and the maturation of it, both physically and mentally. She also proposes that Keys was fortunate to avoid The Future of American Tennis label until now, which is partly due to the sheer number of young American women excelling and partly due to her steady but not spectacular results since that stunning win over a Top 100 player at a tour event when Keys was just 14 years old. At Les Petits As, three US players have reached the third round, with No. 3 seed Caty McNally, No. 5 seed Amanda Anisimova and unseeded Govind Nanda picking up straight-set wins. Nanda defeated No. 14 seed Raphael Vonnet Flores of France 6-4, 6-0 and will take on top seed Jack Draper of Great Britain in the round of 16. Both Whitney Osuigwe and Hurricane Tyra Black lost their singles matches to seeded players, but they had a big win in doubles, taking out No. 2 seeds Ekaterina Makarova and Taisya Pachkaleva of Russia 6-7(5), 6-3, 10-6. McNally and Anisimova, the top seeds are through to the quarterfinals of doubles, as are No. 4 seeds Nanda and Nathan Han. Draws are available at the Tennis Europe tournament page. At the $25,000 women's Pro Circuit event in Sunrise, Florida, qualifier CiCi Bellis defeated No. 4 seed Tatjana Maria of Germany 2-6, 6-2, 6-0 in the first round, and will play last week's winner Darya Kasatkina of Russia. Bellis and Kasatkina played twice last year late in major ITF junior tournaments, with each winning once. Farther north in Palm Coast, at the $10,000 Futures, Reilly Opelka and Francis Tiafoe won their opening matches. Wild card Opelka defeated Florent Diep, the former University of Florida No.1, 7-5, 6-1, while Tiafoe came back for a 4-6, 6-3, 6-2 victory over fellow wild card Alexios Halebian. They join fellow 17-year-old Tommy Paul, who won yesterday, in the second round. I received this email yesterday from current Citadel and longtime Clemson men's head coach Chuck Kriese regarding format change, which he is not against, and scoring change, which he does object to. Here is his document, in its entirety. I have included links to the Bloemendaal position paper and the list of NCAA Cabinet member emails addresses at the bottom of the post. 1. Tennis is: ‘An individual sport that has some team opportunities; whereas, we have wrongfully approached tennis as ‘A team sport looking for individual opportunities.’ We have not made significant headway in either team or individual areas. We have therefore become a ‘Tweener’ as administrators do not see our relevance and player development has become secondary. Potential has been missed. 2. Scoring System and Format are two completely different issues - Each of these should be addressed with unique perspective and considered separately. The Scoring system is a world-wide sacred tradition of our sport and should be honored as such! Formats don’t need to be; Modifications are easily agreed upon. Catering to trends for the sake of mere excitement will not sustain interest nor promote the excellence that is sought for the longevity of our sport. It is only in the honoring of its heritage and its educational intangibles that will ultimately build interest that will last. Educators see the sport of tennis for its great depth and teaching opportunities. Another focus sees the potential to promote through trends of entertainment. These two ideologies do not have to be exclusive and can hopefully be inclusive. However, when both cannot be achieved, a decision has to be made! Each and every coach should have the right to interpret what the best approach for his/her school’s own interests and needs to be relevant. 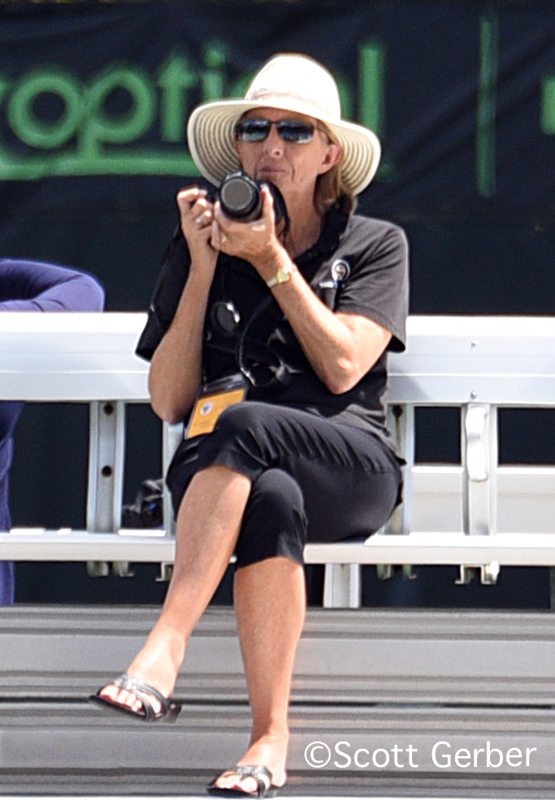 The recent overreach by USTA and ITA causes great concern. The heritage of tennis and time honored traditions of our sport need to be honored and protected. We ask them to do this first and foremost. Opposing points of view have now come to a head as mandates and directives have been pushed by ITA. Transparency to their decision making process has come into question. It is known that the Power 5 conferences of the SEC, the ACC, the Big 10, the PAC 12 and the Big 12 (only 6 men’s teams are in the Big 12) now have conference TV stations. This provides great opportunity for these tennis programs. Their priorities are quite different from those schools without such promotional tools. The ITA has forcefully presumed the power to push forward a format and scoring system that is a widely different from the traditional/educational scoring system of tennis that has been used world-wide for years. Opposition to its implementation is large and continues to grow. The USTA has also been in knee-jerk mode in reaction to the loss of tennis popularity in the U.S.A. The USTA has also leveraged the ITA toward entertainment objectives of the abbreviated formats while attempting to persuade everyone that education will be a natural byproduct. In their overreach, both organizations have not honored the traditions of our sport! The mandates and directives to force abbreviated scoring systems forward are extremely dangerous to the core fundamentals of tennis. Both education and entertainment objectives are in danger of being dismantled in the process. The disregard for the educational opportunity and the depth of our sport is troubling. Also wrong are the skewed results for multiple matches that experimental formats cause. Immediate parity which is not based on skill-set is a wrong approach for any sport if learning and longevity are the goals. It remains puzzling why a simple TV format for special televised matches could not be used as a compromise for all. This question should be asked. There is absolutely no excuse for the ITA’s ongoing disregard for coaches and players points of view. A planned agenda has been pushed through. The ITA is a voluntary, dues paying, coaches organization. Their mission is to advise and serve coaches and to present recommendations to make a good learning environment for our players. It is their duty to listen to all concerns and points of views of all; especially when that view is different than theirs! They have acted inappropriately. • In 2012, nearly 10,000 signatures were expressed on-line against a format change that was initiated after 2012 NCAA Tournament scheduling problems. Time issues had nothing to do with scoring systems. There were simply too many teams being at the final site. The unprecedented pushback by players, coaches and fans was temporarily acknowledged; however, USTA/ITA morphed their approach and presented it again. • In December 2013, the men coaches at the ITA convention voted 21-19 after 5 hours of discussion. The final vote favored keeping traditional scoring with simple adjustments for the 2014 winter season. This vote was ignored by ITA board and different course of action was drawn up in private meeting that same evening. That non-debated format was forced on teams and mandated to be used for the first 6 weeks of the 2014 season. Many skewed results occurred with impact to several teams and coaches. • In ITA’s own poll of 2014 spring, 81% of college tennis players voted to not change singles and 85% voted to not change doubles. These votes were ignored. The significance of this poll was not acknowledged. • One of the Top Players of college tennis conducted an independent petition of collegiate players in fall of 2014. There were 1347 signatures to oppose scoring changes. This was ignored. • A petition was sent out to women’s coaches by a well-respected and veteran coach of 40+ years in late summer of 2014. In response, 194 women’s coaches voted to require ITA to have 2/3 majority to make fundamental changes that significantly impact collegiate tennis. The importance of this petition was opposed by ITA. This well-respected coach received strong criticism from ITA board members. • An MDTA (Men's Division I Tennis Association) poll was conducted in summer of 2014. The vote was 67-11 in favor traditional scoring and to not change to abbreviated format. This vote was ignored. • After tremendous pushback from coaches and players in summer of 2014, the NCAA cabinet tabled the ITA/USTA move to abbreviate the format. The ITA director sent out 3 emails within an 8-day period with directives to all coaches to use abbreviated format for fall events anyway. 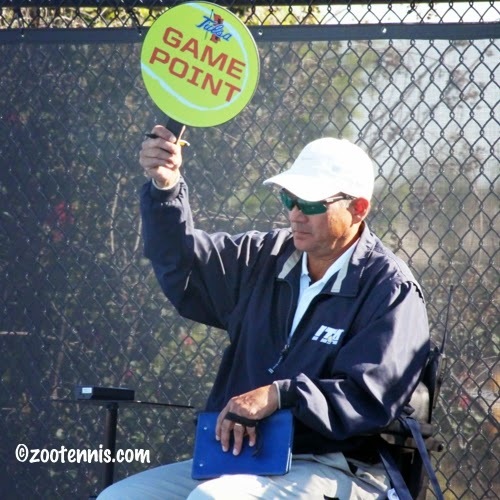 • ITA has recently promoted that their coaches are unanimous for abbreviated scoring. This is an inaccurate assessment. It is based on ITA’s own board vote and their promotions. Multiple coaches were not involved and there were many abstentions to their board’s vote. ITA has recently sent out a latest directive to use abbreviated format for non-conference play. This goes against a long-standing procedure used for years in non-conference play: “When two coaches agree, they can choose to play an experimental format.” For 6 weeks in spring 2014; The fall 2014 and now in the spring of 2015, the ITA has treated their abbreviated format as the norm and traditional scoring as the novel. This is a slight-of-hand and should not be accepted. Their non-conference directive actually has taken it a step further. • At this time, the results of the NCAA poll sent out by NCAA in the fall of 2014 have not been circulated. 1. The ITA is a voluntary coaches organization! Expensive dues are required for their services. They are a reference for college tennis information and conduct tournaments and polls. Their power is implied. It is not absolute! Mandates should not be made by ITA and a minimum 2/3 support from coaches should be required for such fundamental changes in tennis legislation. ITA has acted inappropriately. 2. Just as the NCAA does not have the right nor the power to directly influence decisions made by the USTA, the USTA does not have the right nor power to directly influence the direction of NCAA sports and welfare of Student-Athletes who participate in the sport of tennis. 3. The USTA is a greatly respected organization that is of great service to our youth; however, their finances to the ITA and the pressure (presumed or actual) to push forward their own agendas is a wrong thing to do. 1) Make a simply TV format for college tennis when someone actually does get on TV. 3) Format and scoring system are two completely different issues!!! Appropriate team format changes could easily be acceptable if traditional scoring is honored and not placed in jeopardy. 4) ITA needs to be completely transparent. They should honor and respect their position of being a service organization first and foremost. Politics and policy making should be secondary and only done when 2/3 majority of coaches agree on an action. 5) Although the USTA’s support of our collegiate programs is appreciated, they need to stay out of the legislative business of college tennis. They should not lobby for influence. Sameer Kumar joined Raveena Kingsley and Taylor Fritz in the third round of the Australian Open Junior Championships, while Raquel Pedraza, Michael Mmoh and Will Blumberg have advanced to the quarterfinals in doubles, with all six in action Wednesday (Tuesday night here in the United States). Kumar needed more than two hours and four match points before eliminating No. 9 seed Mikael Ymer of Sweden 6-4, 1-6, 6-4. That has earned the Stanford recruit a meeting with another seed, No. 6 Duck Hee Lee of Korea, who beat Kumar in the first round of the US Open last summer. For more on Kumar's win and his experience as a spectator in the Tim Smyczek - Rafael Nadal match, see this Stuart Fraser report for the ITF junior website. Fraser also spoke to Tereza Mihalikova of Slovakia, who knocked out No. 2 seed Jill Teichmann of Switzerland 5-7, 7-6(5), 7-5. Other girls seeds to lose in the second round Tuesday were No. 9 Luisa Stefani of Brazil, who fell to Canadian Charlotte Robillard-Millette 7-5, 6-1, and No. 15 seed Mariam Kolodziejova of the Czech Republic, who was eliminated by Australian Destanee Aiava 6-3, 7-6(5). With Teichmann and Stefani's losses, No. 6 seed Kimberly Birrell of Australia is the only remaining seed in the bottom half of the draw. Fritz defeated Mandresy Rakotomalala of France 6-1, 6-2 Tuesday to advance against Marko Osmakcic of Switzerland. Osmakcic, who received entry via a special exemption for being in the doubles final at Traralgon, took out No. 13 seed Juan Jose Rosas of Peru 6-1, 6-2. Kingsley, who won her second round on Monday, will play Viktoria Kuzmova of Slovakia for a place in the quarterfinals. Pedraza and her partner Wushuang Zheng of China defeated the eighth-seeded team of Mia Lumsden and Katie Swan 0-6, 6-4, 10-5 to advance to the quarterfinals against No. 4 seeds Sara Tomic of Australia and Shilin Xu of China. Top girls seeds Anna Blinkova of Russia and Dalma Galfi of Hungary lost to Xinyu Gao of China and Olivia Tjandramulia of Australia 7-6(5), 6-4. Mmoh, partnering Miomir Kecmanovic of Serbia, and Blumberg, partnering Orlando Luz of Brazil, will play each other in the semifinals if the No. 3 seeds and No. 2 seeds pick up wins in Wednesday's quarterfinals. The draws at the ITF junior website weren't updated for two days for the Grade 1 in Ecuador, but they have been now, with the first round complete. Ten US boys and five US girls are into the second round, with any seeded player getting a bye. Boys winning their first round matches include qualifiers Gianni Ross, Vasil Kirkov and Patrick Kypson, Mwendwa Mbithi, and Sam Riffice, who is playing his first tournament since sweeping the 16s Eddie Herr and Orange Bowl titles last month. The seeded US boys are Ulises Blanch(2), Emil Reinberg(3), Anudeep Kodali(10), Liam Caruana(14) and Hady Habib(16). There are five US girls through to the second round, with Meghan Kelley, Sofia Sewing and lucky loser Delaney Edwards winning their opening match. Francesca Di Lorenzo(7) and Alexandra Sanford(11) had first round byes. No US players were in action in singles today at Les Petits As. The seven remaining will play second round singles matches on Wednesday. 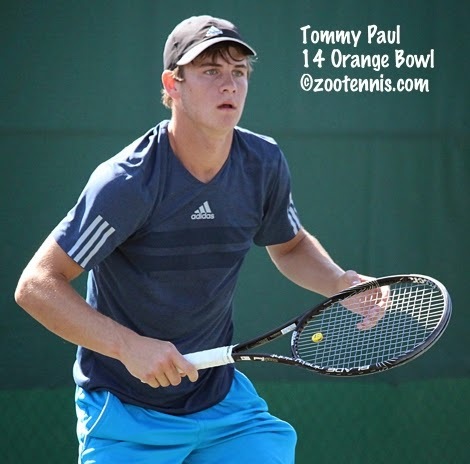 At the $10,000 Pro Circuit Futures in Palm Coast, Florida, Tommy Paul, a special exempt entry, reached the second round with a 7-6(5), 6-1 win over Markus Eriksson of Sweden. Francis Tiafoe, last week's Weston finalist, will play fellow wild card Alexios Halebian Wednesday. Reilly Opelka, who also received a wild card, plays former Florida No. 1 Florent Diep, a qualifier, and Nathan Ponwith, who qualified, plays No. 8 seed Daniel Dutra da Silva of Brazil. Northwestern sophomore Konrad Zieba, who won a wild card tournament to receive entry, lost to No. 2 seed Connor Smith 6-2, 6-3. Former Tulsa star Marcelo Arevalo of El Salvador is the top seed. The qualifying was completed today at the $25,000 women's Pro Circuit event in Sunrise, Florida, with CiCi Bellis the only American winning in the final round. Wild card Katerina Stewart defeated No. 4 seed Allie Kiick 6-3, 6-3, and former USC star Maria Sanchez defeated No. 3 seed Dinah Pfitzenmaier of Germany 2-6, 7-6(3), 7-5. For the third week in a row, Michelle Larcher de Brito of Portugal is the top seed in a Florida $25,000 tournament. She takes on Orange Bowl champion Sonya Kenin, a wild card, in the first round. Louisa Chirico and 16-year-old Anna Kalinskaya of Russia also received wild cards. The $50,000 Maui Challenger is underway, and live streaming is available at usta.com. Rhyne Williams and Jared Donaldson have already posted first round wins. The Tennis Recruiting Network has published its winter recruiting class rankings for men, with Duke finishing atop the poll, followed by Stanford, Georgia, Florida and Vanderbilt. For the complete list, click here. Raveena Kingsley advanced to the third round of the Australian Open Junior Championships Monday in Melbourne, but it was far from easy. The 16-year-old from Maryland served for the first set against Vera Lapko of Belarus at 5-4, but lost the next three games. She recovered to take the second set and then went to extra time before emerging with a 5-7, 6-2, 9-7 win. Kingsley, who also reached the third round at the US Open juniors last September, will play unseeded Viktoria Kuzmova of Slovakia for a place in the quarterfinals. Kuzmova beat No. 7 seed Naiktha Bains of Australia 6-0, 3-6, 6-1. Kuzmova and Kingsley spoke to Stuart Fraser about their matches for the ITF junior website. Jessica Ho and Olivia Hauger lost their second round matches, as did Will Blumberg, who lost to No. 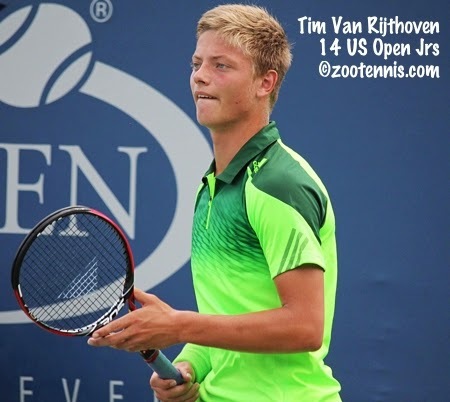 10 seed Tim Van Rijthoven of the Netherlands 4-6, 6-3, 6-4. 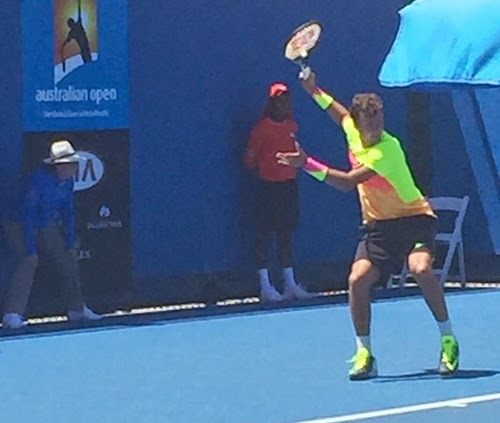 Blumberg had lost to Van Rijthoven in the first round at the Grade 1 in Traralgon, also after winning the first set. Blumberg did advance to the second round in doubles, with partner Orlando Luz of Brazil. Raquel Pedraza, playing with Wushuang Zheng of China, also reached the second round of doubles with a win on Monday. No. 3 seed Taylor Fritz and Sameer Kumar will attempt to join Kingsley in the third round tonight(Tuesday in Australia). No. 4 seed Yunseong Chung of Korea was the major upset victim Monday, losing to Alexander Bublik of Russia 7-6(2), 6-3. Madison Keys defeated Madison Brengle 6-2, 6-4 to move into the women's quarterfinals against Venus Williams. For more on Keys' victory, see this article at the tournament website. The fields are set for the ITA Team Indoor Championships next month, and there were more than a couple of surprises over the weekend. Four No. 1 seeds hosting events lost on the men's side, and three No. 1 seeds hosting lost on the women's side. The women's No. 1 seeds losing were Georgia Tech, Texas A&M and Northwestern. The men's No. 1 seeds losing were Kentucky, Florida, Notre Dame and Texas A&M. Three No. 4 seeds--TCU, Ole Miss and Penn State--advanced to Chicago on the men's side. On the women's side, No. 3 seeds TCU and Kentucky advanced, as did No. 2 seed Oklahoma State. Results of the finals are below. For complete coverage, see the ITA hub page. Although the Florida State women fell short in their quest to qualify for the Team Indoor in Charlottesville, they do have a new recruit, who has joined the team despite being just 11 years old. Casper Ruud of Norway won his third straight ITF Grade 1 title yesterday in Colombia, with the top seeds defeating No. 3 seed Ulises Blanch 6-4, 7-5. Ruud, who three weeks ago was outside the ITF junior Top 100, is now ranked No. 13. The girls title went to No. 3 seed Maria Fernanda Herazo Gonzalez, who delighted her home country's fans with a 6-2, 3-6, 7-6(6) win over Tamara Zidansek of Slovenia in the final. Top seeds Zidansek and Evgeniya Levashova of Russia won the doubles title, beating Juliana Valero of Colombia and Agostina Zamprogno of Argentina 6-1, 6-0 in the final. The boys doubles title went to No. 2 seeds Marcelo Barrios Vera of Chile and Felipe Cunha Silva of Portugal, who beat unseeded Geoffrey Blancaneaux and Ugo Humbert of France 6-2, 6-4. At last week's Grade 4 in the Czech Republic, Kayla Day, the No. 2 seed, reached the final, where she fell to top seed Evan Guerrero Alvarez of Spain 2-6, 6-4, 6-3. The Grade 1 this week in South America is in Ecuador, and there are quite a few Americans traveling there for the first time this week, if the qualifying draws are any indication. The first round of singles at Les Petits As is complete, with seven of eight Americans claiming wins. Caty McNally(3), Amanada Anisimova(5), Whitney Osuigwe and Hurricane Tyra Black all advanced in the girls draw. Govind Nanda, Cannon Kingsley and Nathan Han(6) also won their first round matches; only Leighton Allen suffered a loss. Taylor Fritz and Sameer Kumar reached the second round of the Australian Open junior championships Sunday in Australia, joining the four Americans already securing their opening round wins on Saturday. Fritz hit 13 aces and won 31 of 33 of his first-serve points in his 6-1, 6-4 victory over Slovakia's Alex Molcan, and said after the match that he felt no discomfort from the shoulder. The tournament website featured an article about Fritz's win (great to see junior coverage there so early in the tournament). Fritz will play Mandresy Rakotomalala of France Tuesday. Kumar needed two hours to subdue Japanese qualifier Renta Tokuda, but the Stanford recruit came away with a 6-4, 1-6, 6-3 victory. He will play No. 9 seed Mikael Ymer of Sweden in the second round. Mia Horvit and Raquel Pedraza lost their first round matches to French opponents, with Horvit losing 6-3, 6-3 to Margot Yerolymos and Pedraza falling 6-2, 6-2 to Tessah Adrianjafitrimo. The big story of the day in the juniors was the loss by No. 2 seed Orlando Luz of Brazil, who fell meekly to Germany's Tim Sandkaulen 6-1, 6-2. The only other seed going out on Sunday was No. 16 Tami Grende of Indonesia, who lost to Australian Sara Tomic 6-3, 6-1, although Traralgon champion and No. 7 seed Seong Chan Hong of Korea was severely tested by 2013 Junior Orange Bowl finalist Alex Di Minaur of Australia. Di Minaur, who received a wild card as the Australian 16s National champion, came up just short in a 7-5, 5-7, 8-6 loss. For more on Sandkaulen's upset and also more on Fritz, see the Stuart Fraser report for the ITF junior website. In doubles, No. 3 seeds Mmoh and his partner Miomir Kecmanovic of Serbia advanced, but top seeds Hong and Yunseong Chung of Korea fell to Australians Jake Delaney and Marc Polmans. Ho and Kingsley lost their first round match, as did Hauger and Horvit, both playing with French partners. Pedraza (with Wushuang Zheng of China) and Will Blumberg (second-seeded, with Luz) will play their first round doubles matches Monday. Also on Monday (Sunday night here in the US), Blumberg, Olivia Hauger, Jessica Ho and Raveena Kingsley are scheduled to play their second round singles matches. At the $10,000 ITF Women's event in Saint Martin, Guadeloupe, Usue Arconada picked up her first title at that level, defeating top seed Victoria Bosio of Argentina 7-5, 3-6, 6-1. The 16-year-old from Maryland got the only break of the first set at 5-all in the first and went up 2-0 in the second set, but the 20-year-old Bosio fought back to send it to a third set. Arconada got an early break again in the third, and this time she did not give it back, breaking for a 5-1 lead and serving it out on her second match point. At the $10,000 Weston Futures, No. 7 seed Benjamin Balleret of Monaco won a singles title to go along with his doubles championship, beating Francis Tiafoe 7-5, 6-4. In the first set, Balleret broke to serve for the set, went down 0-40, but won the next five points to take the game. Tiafoe was broken in the first game of the second set, got it back level at 2, but was immediately broken again, and this time Balleret protected the lead, serving the match out at love. In Daytona Beach, 17-year-old Darya Kasatkina of Russia won her second $25,000 tournament since winning the French girls title last spring, beating Elise Mertens of Belgium 6-2, 4-6, 6-0. No. 3 seeds Jan Abaza and Sanaz Marand won the doubles title, beating Mertens and her partner Arantxa Rus of the Netherlands, the No. 4 seeds, 6-4, 3-6, 10-6. The women now move south to Sunrise, Florida, where the qualifying is underway for the $25,000 event there. CiCi Bellis is the top seed in qualifying. There are two men's Pro Circuit events next week--the $50,000 Challenger in Maui and the $10,000 Futures in Palm Coast, Florida, where qualifying concludes on Monday. On the other side of the Atlantic, Les Petits As, the biggest 14-and-under tournament in Europe certainly, and possibly the world, begins tomorrow in Tarbes, France. The top seed in the girls draw is no surprise, with Eddie Herr and Junior Orange Bowl champion Anastasia Potapova of Russia claiming that spot. Unfortunately, Teen Tennis champion Caty McNally, the No. 3 seed, landed in Potapova's half of the draw, so there will be no repeat of the Eddie Herr final. The No. 2 seed is wild card Iga Swiatek of Poland, who lost in the semifinals of last month's Junior Orange Bowl to Potapova, who saved a match point in the third set tiebreaker that decided the match. Amanda Anisimova, who lost to McNally in the Teen Tennis final, is the No. 5 seed. The other two members of the USTA girls team, Hurricane Tyra Black and Whitney Osuigwe, are not seeded. Jack Draper of Great Britain is the top boys seed, with Timofey Skatov of Russia at No. 2. Anton Matusevich of the US, who won the Teen Tennis title, is not in the draw. 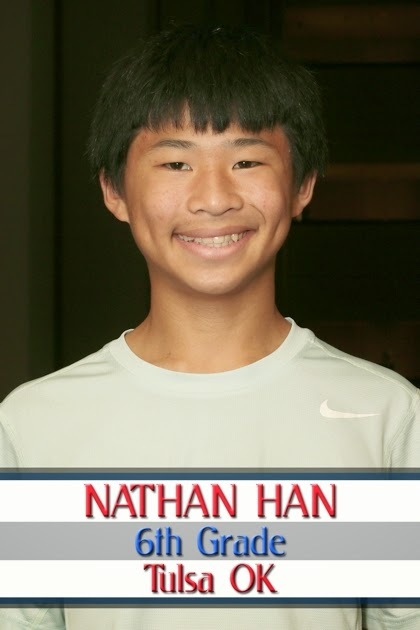 Nathan Han, a Teen Tennis semifinalist, is the only US boy to be seeded; he is No. 6. Other US boys competing are Govind Nanda, Cannon Kingsley and Leighton Allen. William Grant and Andrew Puscas lost in qualifying. Draws are available at the tournament website, or at the Tennis Europe tournament page. Early this morning in the US, 19-year-old Madison Keys completed the biggest victory of her career defeating Wimbledon champion and No. 4 seed Petra Kvitova of the Czech Republic 6-4, 7-5 at the Australian Open, to set up a fourth round encounter with Madison Brengle. Earlier, Brengle had taken out CoCo Vandeweghe 6-3, 6-2 in another all-American matchup. Brengle has already won two of those, beating Irina Falconi in the second round, and she'll get her chance for a third against Keys, who impressed everyone by overpowering Kvitova, who is usually the player doing the overpowering. For more on Keys' win, see this article by Tom Perotta of the Wall Street Journal. The Williams sisters both won their third round matches after trailing by a set, meaning four US women are in the final 16, the most since 2003. It is the first time in the second week of a major for both Keys and Brengle. The US juniors went 4-1 in the first day of play in Melbourne. No. 11 seed Raveena Kingsley beat Monika Kilnarova of the Czech Republic 6-1, 7-6(5), Olivia Hauger, a quarterfinalist last year, recovered to beat Ojasvinee Singh of India 0-6, 6-4, 6-1 and Jessica Ho got her junior slam win with a 6-4, 6-0 win over Australian wild card Jaimee Fourlis. Will Blumberg, who will turn 17 on January 26, also collected his first junior slam victory, cruising past qualifier William Matheson of New Zealand 6-1, 6-1. The lone loss was suffered by No. 5 seed Michael Mmoh, who was beaten by Sumit Nagal of India 6-2, 4-6, 6-4. Nagal reached the semifinals of the Grade 1 in Traralgon, so that was a tough first round for both players, but it is the second straight junior slam that Mmoh has exited in the first round. No. 3 seed Marketa Vondrousova of the Czech Republic, No. 8 seed Fiona Ferro of France and No. 8 seed Jumpei Yamasaki of Japan were the other Top 8 seeds ousted Saturday. For more on the first day of singles play, see the ITF website, where Stuart Fraser is providing onsite coverage. Four US juniors will play in tonight's (Sunday in Australia) completion of the first round, including No. 3 seed Taylor Fritz, who takes on Alex Molcan of Slovakia. Sameer Kumar plays Japanese qualifier Renta Tokuda of Japan, Mia Horvit gets Margot Yerolymos of France and Raquel Pedraza faces Tessah Andrianjafitrimo, also of France. The doubles competition also begins tonight. Ho and Kingsley are playing together again this week after making the semifinals in Traralgon, but the other three US girls are playing with partners from other countries. Taylor Fritz, who had planned on playing with Michael Mmoh, is not in the draw, no doubt due to the shoulder pain that forced him out of Traralgon. Mmoh will be playing with fellow IMG student Miomar Kecmanovic of Serbia, and they are the third seeds. Blumberg is partnering Orlando Luz of Brazil, and they are seeded second. For junior draws, click here. Several junior matches each day will be live streamed via Watch ESPN. Two Junior Tennis Champion Center students will play in their first $10,000 tournament finals on Sunday. Francis Tiafoe overcame the loss of six straight games in the middle of the match to beat No. 6 seed Markus Eriksson of Sweden 6-3, 5-7, 6-0 in the Weston Futures. That sets up a rematch with No. 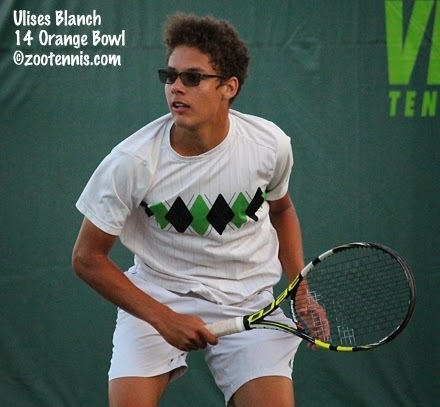 7 seed Benjamin Balleret of Monaco, who beat him 6-3, 6-0 in the semifinals last week in Sunrise. Tiafoe, who just turned 17, had beaten the 32-year-old Balleret in the first round of qualifying at the ATP Atlanta tournament last summer, so Sunday's meeting will be the rubber match for the two. Today, Tiafoe was serving at 6-3, 5-1, lost six straight games, then won six straight games to pick up his third win over Eriksson. Usue Arconada reached her first pro level final at the ITF Women's Circuit event in Guadaloupe. The unseeded 16-year-old beat Maria Fernanda Alves of Brazil 6-3, 6-3 in the semifinals and will meet top seed Victoria Bosio of Argentina for the title. 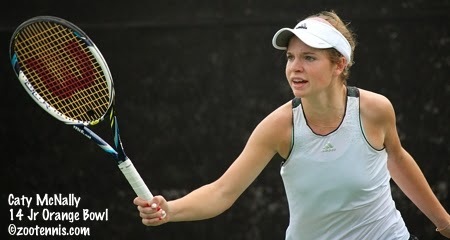 Bosio defeated Nicole Frenkel 6-2, 7-5 in the semifinals. Former Alabama All-American Alexa Guarachi won the doubles title, with former Georgia player Ayaka Okuno. The top seeds beat Lena Litvak(Harvard) and Sonja Molnar of Canada(Iowa), the No. 3 seeds, 7-5, 6-3 in the final. At the ITF Grade 1 in Colombia, Ulises Blanch has reached his first Grade 1 final and will attempt to keep Norway's Casper Ruud from winning his third straight in Sunday's championship match. No. 3 seed Blanch defeated Nuno Borges of Portugal 6-4, 6-2 in the semifinals, while No. 1 seed Ruud downed Felipe Cunha Silva, also of Portugal, 6-2, 6-1. In the girls final, No. 2 seed Tamara Zidansek of Slovenia will play No. 3 seed Maria Fernanda Herazo Gonzalez of Colombia. The draws are out for the Australian Open junior championships, and my preview of the tournament is available now at the Tennis Recruiting Network. First round action, which is split over two days, begins tonight in the US, with five of the nine American juniors and both No. 1 seeds on the Day One schedule. Olivia Hauger, a quarterfinalist last year, plays Ojasvinee Singh of India, Jessica Ho faces Australian wild card Jaimee Fourlis and William Blumberg meets qualifier William Matheson of New Zealand. Two of the three seeded Americans are also in action, with No. 11 Raveena Kingsley playing Orange Bowl semifinalist Monika Kilnarova of the Czech Republic and No. 5 seed Michael Mmoh taking on Sumit Nagal of India, who reached the semifinals at the warmup Grade 1 in Traralgon. That leaves Taylor Fritz(3), Sameer Kumar, Mia Horvit and Raquel Pedraza to play on Sunday in Melbourne(Saturday night here in the US). Complete draws are at the tournament website, with live scoring also available. In addition to the five junior matches, eight other Americans will be playing singles matches, with John Isner(19) taking on Gilles Muller of Luxembourg and Steve Johnson playing No. 5 seed Kei Nishikori of Japan and on the women's side, Serena Williams(1) playing Elina Svitolina(26) of Ukraine, No. 30 seed Varvara Lepchenko playing Agnieszka Radwanska(6) of Poland, Madison Keys meeting No. 4 seed Petra Kvitova of the Czech Republic, Venus Williams(18) facing Camila Giorgi of Italy, and CoCo Vandeweghe and Madison Brengle squaring off. At the Nike Junior International Teen Tennis tournament in Bolton, England, the US swept the singles titles, with No. 2 seed Caty McNally beating doubles partner Amanda Anisimova, the No. 8 seed, 6-1, 6-3 and wild card Anton Matusevich defeating No. 10 seed Lodewijk Weststrate of the Netherlands 6-3, 6-1. This is the first sweep of the singles titles by the US since 2010, when Gabby Andrews and Stefan Kozlov were the Bolton champions. The successful US contingent now moves on to Tarbes, France for Les Petits As, with qualifying beginning there on Saturday. Former Bolton champion Francis Tiafoe is playing this week at the $10,000 Futures in Weston, and he has reached the semifinals for the second consecutive week with a 6-4, 6-7(7), 6-1 win over fellow 17-year-old Tommy Paul. Tiafoe, a wild card, battled back from 5-2 down in the second set, and had a match point with Paul serving at 5-6 in the tiebreaker, but didn't convert it. Tiafoe went up 4-0 in the third set, but was broken in a long fifth game, momentarily giving Paul hope of recovering. But Paul was broken in the next game and Tiafoe served out the match, with No. 6 seed Markus Eriksson of Sweden awaiting him in the semifinals. Tiafoe beat Eriksson 6-1, 6-2 last week in the Sunrise Futures quarterfinals, and also beat the 25-year-old Swede last year in the Palm Coast Futures. In Daytona Beach, Samantha Crawford lost to Sara Sorribes Tormo of Spain 6-4, 6-4 in the quarterfinals of the $25,000 Pro Circuit event, so all Americans are out of singles there. At the ITF Grade 1 in Colombia, Americans Emil Reinberg(5), Ulises Blanch(3) and Hady Habib(15) have reached the quarterfinals in the boys draw. Francesca Di Lorenzo(7) and Maria Mateas(14) are also into the girls final eight. Top seed Evgeniya Levashova of Russia lost in the second round to qualifier Melany Krywoj of Argentina. Top boys seed Casper Ruud of Norway's quest for a third straight Grade 1 title is still alive. The ITA Kick-off Weekend, which will decide the 15 men's and 15 women's teams that will participate in next month's National Team Indoor Championships (hosts Virginia women and Illinois men are automatically granted the 16th place), is underway. See the ITA hub page for the participating schools and the results throughout the weekend. The Mississippi men's team is traveling to Florida for a first round match with the Gators on Saturday, and senior Nik Scholtz has bolstered the Rebels prospects for the season by returning to school for his senior year. Scholtz, who won three Futures title while taking the fall off, is now 462 in the ATP rankings, but he decided to return to Oxford, with finishing his degree a major factor. For more on his decision, see this article from the Ole Miss website. There's so much going on right now in tennis, in some wildly divergent time zones, it's hard to know where to begin. I'll start in Bolton, England, where two American girls and one boy have reached the final of the big 14-and-under Nike Junior International Teen Tennis tournament. No. 8 seed Amanda Anisimova defeated No. 14 seed Hurricane Tyra Black 6-3, 6-2 in the all-American semifinal and will meet fellow 13-year-old Caty McNally in the final. McNally, the No. 2 seed, defeated French qualifier Loudmilla Bencheikh 6-1, 6-1. Later in the day, McNally and Anisimova teamed up for the girls doubles title, defeating unseeded Sonay Kartal and Mae McCutcheon of Great Britain 6-1, 6-1 in the final. In the boys semifinal, No. 10 seed Lodewijk Weststrate of the Netherlands prevented an all-American boys final, defeating No. 12 seed Nathan Han 3-6, 6-4, 6-2. Weststrate will play unseeded wild card Anton Matusevich of the US in the final, after Matusevich defeated No. 2 seed Adrian Andreev of Bulgaria 7-6(10), 6-2. Han lost again to Weststrate in the boys doubles final, when No. 2 seeds Weststrate and partner Nini Dica of Romania beat No. 4 seeds Han and Govind Nanda 6-1, 6-3. Complete draws are at the Tennis Europe tournament site. In Melbourne, nine Americans--seven women and two men--have reached the third round of the Australian Open. Steve Johnson and John Isner are the men and the women are Venus and Serena Williams, Madison Keys, Madison Brengle, CoCo Vendeweghe, Varvara Lepchenko and Bethanie Mattek-Sands, who plays Simona Halep tonight. For more on the US players in the third round, see Courtney Nguyen's article for Sports Illustrated. At the ITF Grade 1 in Traralgon, Australia, Seong Chan Hong of Korea and Katherine Sebov of Canada won the singles titles Thursday. The unseeded Sebov defeated No. 5 seed Kimberly Birrell of Australia 7-5, 6-2, to claim her first Grade 1 title. Hong, the No. 6 seed, defeated Tim Van Rijthoven of the Netherlands 6-1, 3-6, 6-2 to win his first Grade 1 title since 2012. Van Rijthoven did capture the doubles title, with he and Akira Santillan of Australia, the No. 4 seeds, defeating unseeded Marko Osmakcic of Switzerland and Andrea Pellegrino of Italy 6-3, 5-7, 10-5. No. 6 seeds Vera Lapko of Belarus and Tereza Mihalikova of Slovakia won the girls doubles championship, beating unseeded Olga Fridman of Ukraine and Eline Nepliy of Russia 7-5, 7-5. The Australian Open junior draws should be out later tonight, with play beginning on Saturday (Friday night in the US) and I will have a preview available Friday morning for the Tennis Recruiting Network. I did learn that Taylor Fritz is expected to play, with shoulder pain the reason for his walkover in the Traralgon quarterfinals. Speaking of Fritz, the San Diego Union-Tribune featured the 17-year-old South Californian in this article, revealing he has narrowed his choice of colleges to Southern Cal or UCLA. Fritz plans to make his decision by this summer, and hope to finish school a semester early and start in January of next year. Fritz's father Guy provides some sound reasons for believing his son should spend some time in college before going out on the tour. At the $10,000 Weston Futures, 17-year-olds Francis Tiafoe and Tommy Paul picked up wins today and will play each other for a place in the semifinals. Tiafoe, a wild card, beat No. 8 seed Facundo Mena of Argentina 6-3, 6-2, while Paul, a lucky loser, ousted top seed Christian Lindell of Sweden 6-4, 6-4. 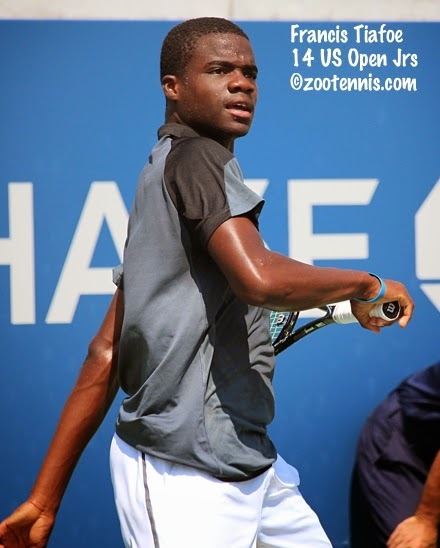 Paul and Tiafoe last met in the 2013 Kalamazoo 16s semifinals, with Paul winning 6-2, 6-4. Former Florida star Greg Ouellette is the other US player in the quarterfinals, after he defeated Alex Rybakov 7-6(5), 6-3, and he will play No. 2 seed Darian King of Barbados on Friday. At the $25,000 women's Pro Circuit event in Daytona Beach, Samantha Crawford is the only American in the quarterfinals, after losses today by Sachia Vickery(3), Maria Sanchez(8) and qualifier Lauren Embree. I'll close with some sad news from the college tennis world--yesterday's passing of former Division III Gustavus Adolphus coach Steve Wilkinson, the all-time leader in men's college tennis victories. Wilkinson, who coached at Gustavus Adolphus for 39 years and won 929 matches, was one of the most respected and influential coaches in the sport throughout his career. For more on his playing and coaching accomplishments and his legacy, see the school's website. The final eight players in both the boys and girls main draws at the Australian Open junior championships will be decided tonight, when the second and final round of the qualifying is completed in Traralgon. All three US girls in the qualifying lost their first round matches last night. The finals are set at the Grade 1 in Traralgon. Australia's Kimberly Birrell, a wild card seeded No. 6, will play unseeded Canadian Katherine Sebov for the girls championship. The boys final will feature No. 6 seed Seong Chan Hong of Korea and No. 10 seed Tim Van Rijthoven of the Netherlands. Raveena Kingsley and Jessica Ho, the last Americans still alive there, lost their doubles semifinal 6-0, 6-4 to Vera Lapko of Belarus and Tereza Mihailkova of Slovakia, who will play Olga Fridman of Ukraine and Elina Nepliy of Russia in the final. The boys doubles final has Van Rijthoven and Akira Santillan of Australia facing Marko Osmakcic of Switzerland and Andrea Pellegrino of Italy. Osmakcic and Pellegrino received the two special exemptions into the main draw of the Australian junior singles due to their success in doubles in Traralgon. Nepliy was one out of qualifying at the freeze date, so she did not receive a special exemption, but she did move into qualifying and won her first round match Wednesday. In the men's and women's Australian Open, Bethanie Mattek-Sands was the only American to advance to the third round Wednesday, with 13 more getting their chance Thursday (tonight in the US). Christina McHale and qualifier Tim Smyczek lost, but Smyczek's 4-hour battle with Rafael Nadal, won by the No. 3 seed 6-2, 3-6, 6-7(2), 6-3, 7-5, was the talk of the tennis world today. Much of the conversation centers on Smyczek's sportsmanship when Nadal was serving for the match at 6-5 in the fifth. Ben Rothenburg has more on the incident and the reaction for the New York Times. At the Nike Junior International Teen Tennis tournament in Bolton, England, three of the girls semifinalists are from the US and two of the boys semifinalists. Amanda Anisimova, the No. 8 seed, defeated No. 1 seed Oona Orpana of Finland 6-3, 6-2 to advance against compatriot Hurricane Tyra Black. Black, the No. 14 seed, defeated unseeded wild card Holly Fischer of Great Britain by the same score. Caty McNally, the No. 2 seed, defeated unseeded Victoria Allen of Great Britain 6-3, 6-4. McNally will play French qualifier Loudmilla Bencheikh in the semifinals. McNally and Anisimova have reached the doubles final against the unseeded British team of Sonay Kartal and Mae McCutcheon, which will be played on Thursday. Nathan Han, seeded No. 12, took out top seed Jack Draper of Great Britain 1-6, 6-1, 6-1 to advance to the semifinals, where he will meet No. 10 seed Lodewijk Weststrate of the Netherlands. Weststrate defeated No. 16 seed Cannon Kingsley 6-3, 6-7(5), 6-2 to prevent an all-American semifinal. Wild card Anton Matusevich, the other US boy in the semifinals, defeated No. 9 seed Duje Ajdukovic of Croatia 7-5, 6-2 to set up his encounter with No. 2 seed Adrian Andreev of Bulgaria, who has yet to lose more than four games in a set. No. 4 seeds Han and Govind Nanda defeated top seeds Roi Ginat of Israel and Mihailo Popovic of Serbia 6-3, 6-4 to advance to Thursday's final, where they will meet No. 2 seeds Weststrate and Nini Dica of Romania. Complete draws are available at the Tennis Europe tournament site. At the $10,000 Futures in Weston, wild card Francis Tiafoe and qualifier Dennis Uspensky won their first round matches, while Reilly Opelka fell to top seed Christian Lindell of Sweden. Connor Smith and Greg Ouellette also picked up victories. In Daytona Beach, Samantha Crawford, Sachia Vickery, Lauren Embree and Maria Sanchez reached the second round of the $25,000 tournament there. For the second week in a row, top seed Michelle Larcher de Brito of Portugal lost in the first round, this time to Elise Mertens of Belgium. The qualifying draws for the Australian Open Junior Championships were released Tuesday, with play beginning tonight (Wednesday in Australia) and finishing tomorrow night. This year the draw is a standard 32, the same as the other junior slams, with two wins required to reach the main draw. In past years, the Australian junior qualifying has been larger. Three Americans are in the qualifying--Madison Bourguignon(3), Ally Miller-Krasilnikov and Stephanie Hazell. Olivia Hauger was one spot out of the main draw at the freeze deadline, but she is not in the qualifying draw, so I assume last year's quarterfinalist moved in when the special exemptions weren't used. There are no US boys in qualifying this year. At the Grade 1 in Traralgon, the upsets continued, with No. 10 seed Tim Van Rijthoven of the Netherlands taking out No. 2 seed Roman Safiullin of Russia 7-6(6), 7-5 to reach the semifinals. No. 3 seed Taylor Fritz gave a walkover to unseeded Sumit Nagal of India, but no reason was provided. Nagal will play No. 6 seed Seong Chan Hong of Korea and Van Rijthoven will play unseeded Alexander Bublik of Russia. Rijthoven beat Bublik in three tough sets in the quarterfinals of the Grade 1 International Hard Courts last August, where he reached the final. Australian Kimberly Birrell, a wild card seeded No. 5, reached the girls semifinal with a tough win over Eddie Herr champion Dalma Galfi, the No. 4 seed from Hungary. Birrell will face unseeded Tessah Andrianjafitrimo of France, while two unseeded players will meet in the other semifinal. Canadian Katherine Sebov, who received a walkover, again unexplained, from No. 2 seed Marketa Vondrousova of the Czech Republic, will face Vera Lapko of Belarus in the other semifinal. Raveena Kingsley and Jessica Ho have reached the doubles semifinals, after the No. 5 seeds defeated top seeds Galfi and Anna Blinkova of Russia 6-2, 3-6, 10-8. It was Kingsley and Ho's third straight win in a match tiebreaker. A total of 16 Americans have reached the second round of the Australian Open--12 women and four men, including two-time NCAA champions Steve Johnson and Nicole Gibbs. A recap of the Americans' Day Two action is available at usta.com. Among the biggest wins was Madison Brengle's 5-7, 7-6(4), 6-3 victory over No. 13 seed Andrea Petkovic of Germany. In the post match news conference, Brengle revealed she had recently had skin cancer, jeopardizing her trip to Australia, and has a benign growth in her jaw which will require reconstructive surgery. 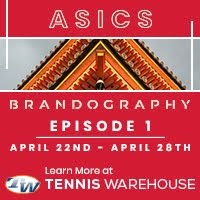 For more on Brengle's match, see the website's article. Quotes from Brengle on her health scare can be found at the Wall Street Journal. In Bolton, England, six US players--3 boys and 3 girls--have reached the quarterfinals of the Nike Junior International Teen Tennis tournament for 14-and-under players. No. 2 seed Caty McNally needed three sets to get by Eddie Herr 12s champion Himari Sato of Japan 6-1, 5-7, 6-1. Amanda Anisimova(8) and Tyra Hurricane Black(14) both won their matches in straight sets. The US boys advancing to the final eight are Nathan Han(12), Cannon Kingsley(16) and wild card Anton Matusevich, all of whom won today in straight sets. Han will play top seed Jack Draper of Great Britain Wednesday. Han and Govind Nanda, the No. 4 seeds, have reached the doubles semifinals, as have McNally and Anisimova, the No. 2 seeds. Complete draws are available at the Tennis Europe tournament page. The second Division I team rankings of the year were released today, with the Southern Cal men and UCLA women remaining atop the polls. With most teams just beginning to play dual matches, there wasn't likely to be a dramatic change, but the Duke women's 4-3 win over William and Mary caused their ranking to drop from 2 to 4. The Georgia women's loss to Baylor sent them from 5 to 10, with Baylor moving from 15 to 9. The ITA release is here. In the first day of main draw singles at the $10,000 Weston Futures, wild card Alex Rybakov and lucky loser Tommy Paul picked up victories. Rybakov defeated David Vega Hernandez of Spain 6-3, 6-2 and Paul outlasted wild card Walker Duncan 6-3, 5-7, 6-3. Wild card Francis Tiafoe and qualifiers Dennis Uspensky and Reilly Opelka are American teens on Wednesday's schedule. At the $25,000 women's event in Daytona Beach, qualifying was completed today with former Florida star Lauren Embree and Russian teenager Natalia Vikhlyantseva among those reaching the main draw. World No. 1 junior CiCi Bellis was defeated in her first round match, one of four main draw matches played today, losing to 24-year-old Arantxa Rus of the Netherlands, herself a former junior No. 1, 6-2, 6-4. The ITF today announced the fields for its new April competition in China, the Junior Masters. As I mentioned in my annual Intriguing Questions column for the Tennis Recruiting Network last week, there didn't seem to be a clamor to participate by the top juniors, but the ITF did receive commitments from World Junior champion Andrey Rublev of Russia and No. 2 Shilin Xu of China. Reserved for the top eight players in the ITF year-end rankings, the ITF only had to reach to No. 13 to fill those draws, with Gabby Ruse of Romania and Marcelo Zormann of Brazil the last two players in. Zormann is the only one of the 16 players no longer eligible to compete in the ITF juniors--he turns 19 in June. CiCi Bellis, the ITF girls World Junior champion, is not playing, nor is Stefan Kozlov. The US will be represented by Taylor Fritz and Michael Mmoh. The ITF also mentioned in this announcement that it has received commitments for wild cards for the winners, but all commitments are for Challenger level or below. Matches will be live streamed. Six Americans kicked off play in Australia last night, with three of them--qualifier Tim Smyczek, Christina McHale and Bethanie Mattek-Sands posting victories. McHale's 12-10 in the third win over qualifier Stephanie Foretz of France was especially notable, given her oncourt vomiting at 4-4 in the third. That leaves 18 Americans on tonight's schedule, including two in high profile matches, with Sloane Stephens facing two-time women's champion Victoria Azarenka and Taylor Townsend meeting No. 8 seed Caroline Wozniacki. The order of play is available at the tournament website. At the Nike International Junior Teen Tennis in Bolton, all three seeded US girls advanced, with Amanda Anisimova(8), Caty McNally(2) and Tyra Hurricane Black(14) reaching the third round with straight set wins. Whitney Osuigwe lost to No. 7 seed Paula Joukanen of Finland 6-4, 5-7, 7-5. Two of the US boys who lost went out to the top two seeds, with Andrew Puscas losing to No. 1 Jack Draper of Great Britain and Leighton Allen falling to No. 2 seed Adrian Andreev of Bulgaria. Nathan Han(12) and Cannon Kingsley(16) won their matches, but No. 8 seed Govind Nanda lost. Qualifier William Grant beat the No. 7 seed, and wild card Anton Matusevich defeated the No. 4 seed, giving the US four boys in the final 16. Qualifying is complete at the $10,000 Weston Futures, with 18-year-old Dennis Uspensky and 17-year-old Reilly Opelka the two American qualifiers. Opelka defeated former Georgia star Wil Spencer, who had won his first Futures title last November after a lengthy hiatus, 6-2, 6-3 in the final round of qualifying today. The final round of qualifying will be played Tuesday at the $25,000 women's event in Daytona Beach, but the draw is out. Michelle Larcher de Brito of Portugal is again the top seed. Plantation champion Sachia Vickery has drawn wild card Katerina Stewart, and CiCi Bellis will play Arantxa Rus of the Netherlands in the first round. Plantation finalist Samantha Crawford received a special exemption into the main draw and will play a qualifier. A few notes from college tennis. Roberto Quiroz of Southern California won the Sherwood Cup, a prestigious individual tournament in California prior to the start of the dual match season. The field was strengthened this year by the addition of Baylor, including Julian Lenz, fresh from his Futures final in Plantation two weeks ago. Lenz lost to UCLA's Dennis Mkrtchian in the semifinals, while Quiroz beat teammate Jonny Wang. Quiroz downed Mkrtchian 6-2, 6-0 in today's final. 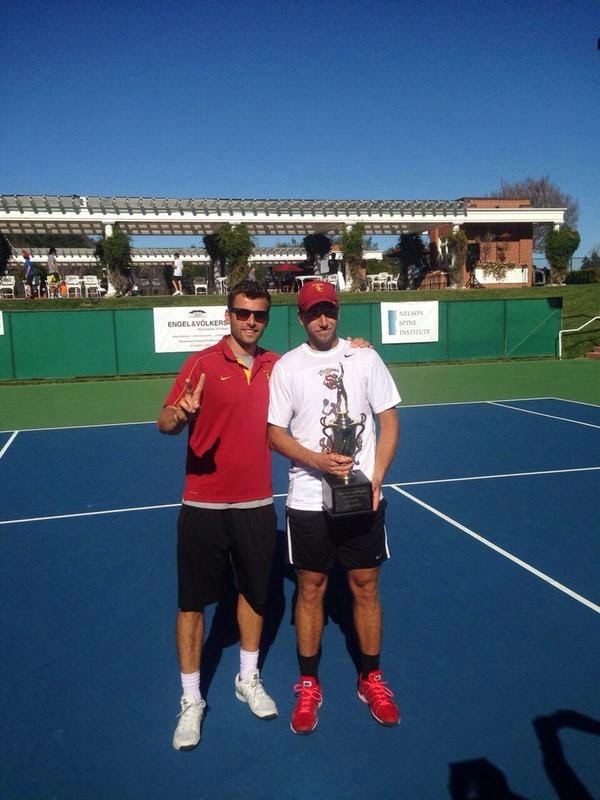 Stanford's Tom Fawcett and Maciek Romanowicz won the doubles title, beating Quiroz and Max de Vroome 6-4. Complete results can be found here. Those speculating on the future of Jennifer Brady now have all the evidence they need that she is indeed back competing on the collegiate level this spring. Brady, currently 217 in the WTA rankings, won the Freeman Memorial tournament in Las Vegas, beating Giuliana Olmos of Southern Cal 7-6, 0-6, 7-5. Kyle McPhillips of UCLA won the National Collegiate Tennis Classic in Palm Springs, beating Lorraine Guillermo of Pepperdine 3-6, 7-5, 6-3. In dual match action, the second-ranked Duke women survived 4-3 against William and Mary Sunday, and today, the No. 12 Duke men defeated No. 18 Kentucky 5-2 in Lexington. No. 14 Notre Dame had beaten Kentucky 4-3 on Saturday. The No. 34 Northwestern men defeated No. 19 Vanderbilt 4-3 in Nashville Sunday, and No. 15 ranked Baylor defeated No. 5 Georgia 4-3 in Waco Sunday. The ITA has announced the hiring of a search firm to fill its Executive Director's position now that David Benjamin has set a July date for his retirement. The release, with link to the job description, is here. The Junior Tennis Champions Center in College Park, Maryland has announced a partnership with former ATP star and now coach Brian Gottfried and the Bolles School in Jacksonville, Florida. For more on the partnership between the JTCC and the college prep school, see the school's website. The JTCC has also recently announced a partnership with Wilson.